My grandma turned 99 yesterday. It should have been a bigger event, but I was reminded by an electronic notification. She is in hospice care in AZ, a long way from Seattle. I’ve visited her once/twice a year for the past 10 years and watched her slow decline from a distance while raising a family in Seattle. I’m sad that I missed this moment, but I may have a chance to hit the big 100 with her. It feels like a big deal that a family member is reaching this age. Not many people these days can live nearly a century. 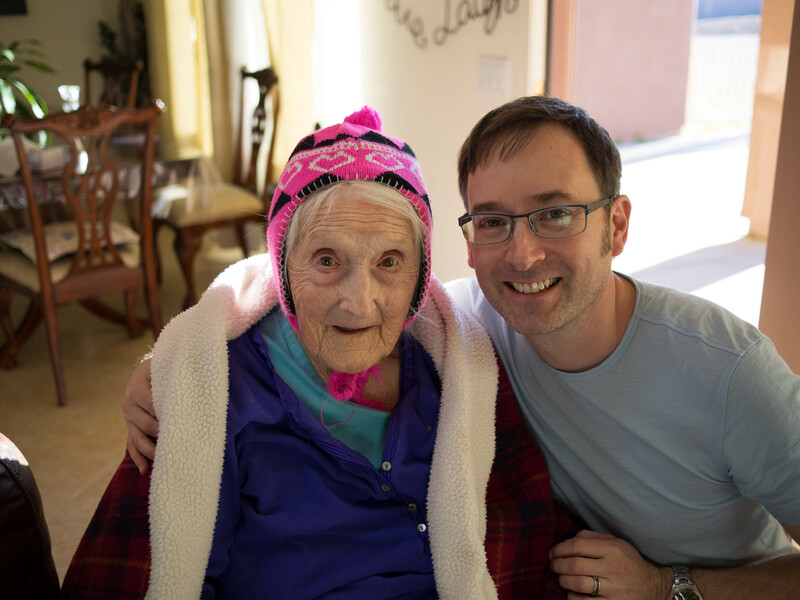 My great grandma Viola lived to 99, but most people I know are gone by 80. I feel like I need to start writing about my experiences with Mabel – she was easily the most colorful character in my immediate family, and was always a loving grandparent. The kind that always had a big smile when I showed up. I spent a lot of time with her in my childhood – she lived an hour north of us in the Twin Cities. Mabel and Ralph had 80 acres in Bradford, MN, and it was always like a fairy tale when I went up there to visit in the summer. My folks would bring me and my sister up for several weeks at a time to stay on “the farm”. It wasn’t really a farm, but sort of a hobby ranch. No animals other than wild – I recall deer, rabbits, squirrels, and birds of all sorts. It was a great place for my formative years as I was allowed quite free reign. Not too much to worry about as they lived on a rural road on a lot of forested and swamped land. They had planted trees on the majority of the land – rows and rows of pines that were 20 feet tall when I was learning to hunt at the ripe age of 10. My grandparents were Scoutmasters when my dad and his brother were growing up, so needless to say they instilled a love of the outdoors in me. When it was 90 and humid on the farm, they took us up to the north shore of Lake Superior for epic camping trips in the 60-70 degree mild inland sea climate north of Duluth. I would be allowed free reign there, as well – I don’t think this would happen as much today, but I ran all over the shoreline, and did a lot of hiking up river (Temperance River). I recall trips of 2 weeks at a time. I got my first knife at the farm. I got my first gun, a Red Ryder styled Daisy BB gun. I shot my first .22. I killed my first bird (traumatic unintentional ceremonial burial – cried my eyes out). I went duck hunting with my dad and grandpa. I drove the tractor all over the place. I explored for days, got poison ivy, wood ticks, many mosquito/deerfly/horsefly bites. I worked on wood projects in my grandpa’s shop – learned to sand, shape, cut with the jigsaw, build stuff. They moved to Arizona at some point – they had been going there for years in the winters, but I don’t remember the year they bought a place in Mesa – probably while I was distracted in Jr. or Sr. High.